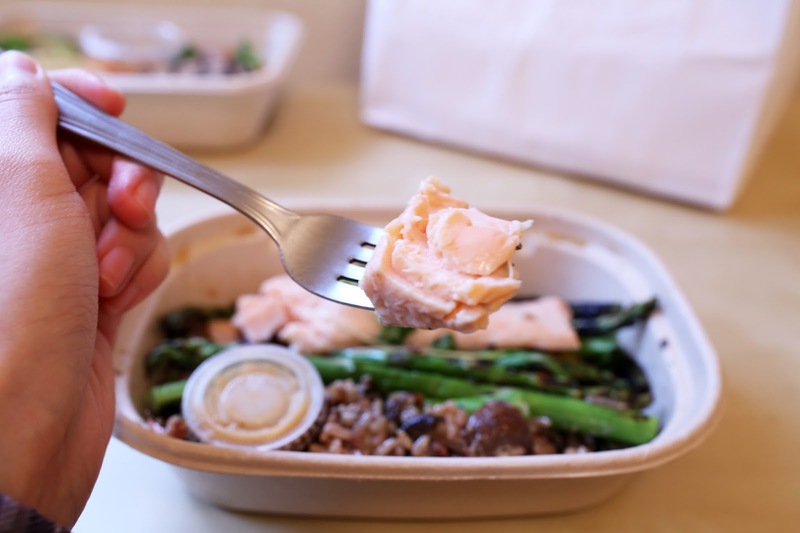 This is the first time I am trying Munchery because I saw one of their entree, "White Miso Salmon." I was just curious to try it out, never really expecting a delicious meal. BUT it turns out to be surprisingly great in terms of flavor, nutrition, and healthy food choices. Food lovers living in the US! Don't forget to get a free $20 credit from me for your first Munchery meal! In the Bay Area (in North California), it's been raining every day. Today, I just can't stand going out to get food anymore. That's how I started looking for delivery option. While browsing for food on the internet, I found "White Miso Salmon" and it just sounds too good to resist. I quickly ordered it (it was in the morning) and I chose to get it delivered around 4-5pm. The delivery was very punctual, and the delivery person was friendly and polite. Now here it is, my first Munchery experience! When I first received my food! The lid seems to be a bit wet from the rain! The food inside is not affected by the rain at all! Atlantic salmon is marinated in white miso, ginger, sake, and honey and then oven-roasted until medium-rare so it's moist and flavorful. As you can see, the meat is almost cooked through and not too heavily seasoned. It is very tender! 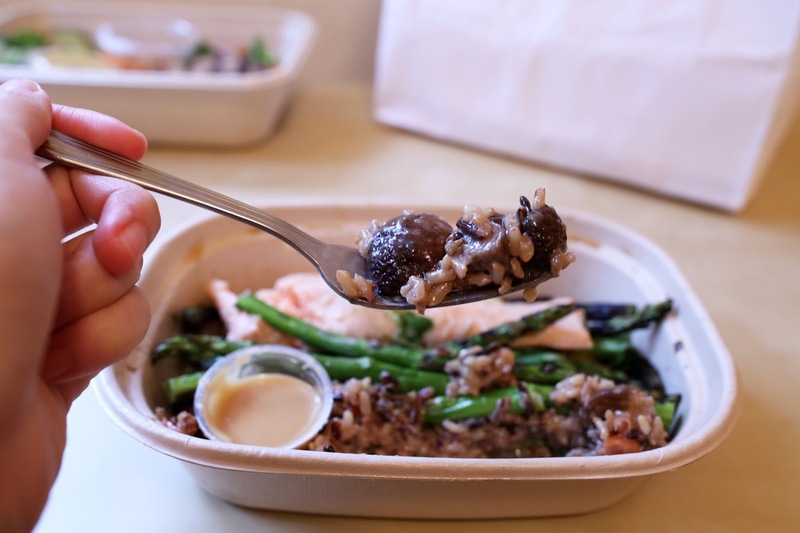 The mixed wild rice is very flavorful, the brown mushrooms (crimini mushroom) are very juicy, particularly good when consumed with the rice. 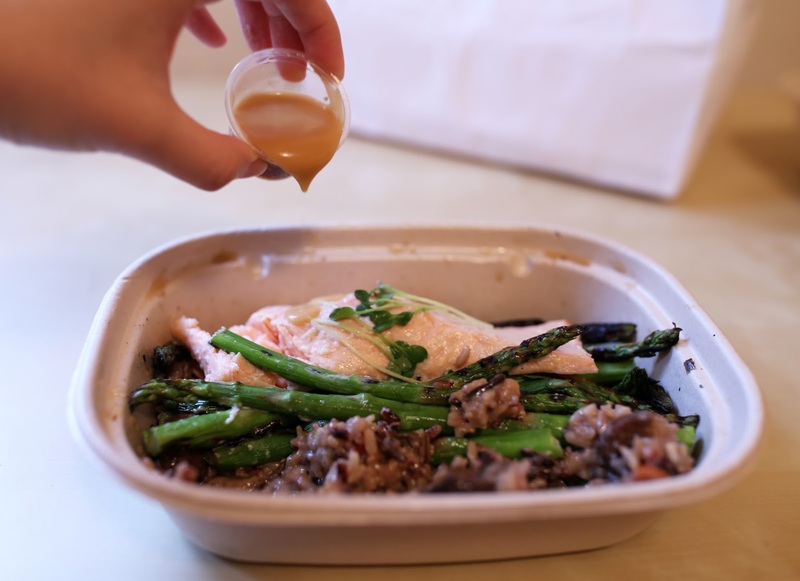 For vegetables, there are grilled asparagus, Bok Choy, carrot dice, all will be tossed with the house-made ginger-soy dressing. Yummy and healthy! The meal actually turns out better than I expected. Like many of us would imagine about delivery meal, at least I've always thought the food probably will end up getting soggy, lack of flavor, using non-fresh ingredients. (something like airplane food...) But everything I had in this entree was pretty good. 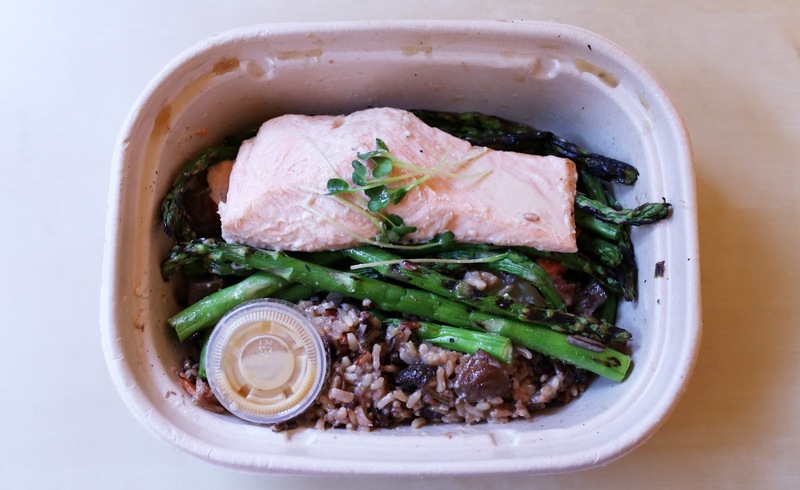 The salmon is tasty and tender, the vegetables are fresh and bright in colors, the mixed wild rice are extremely healthy and delicious! One of the most surprising thing that still shock me is the rice. I've always thought mixed grain rice tastes bland and disgusting. But obviously, this meal proves me wrong. Whatever food it is, if it is cooked right, it could taste extremely good and addicting too! Use this link to sign up and get $20 off from your first order. That should give you perhaps a free entree + dessert + drink. *Please note that you will still need to pay a $3.95 delivery fee even though your entire order is $16 or less. (Thanks to Christine M. for this correction!) 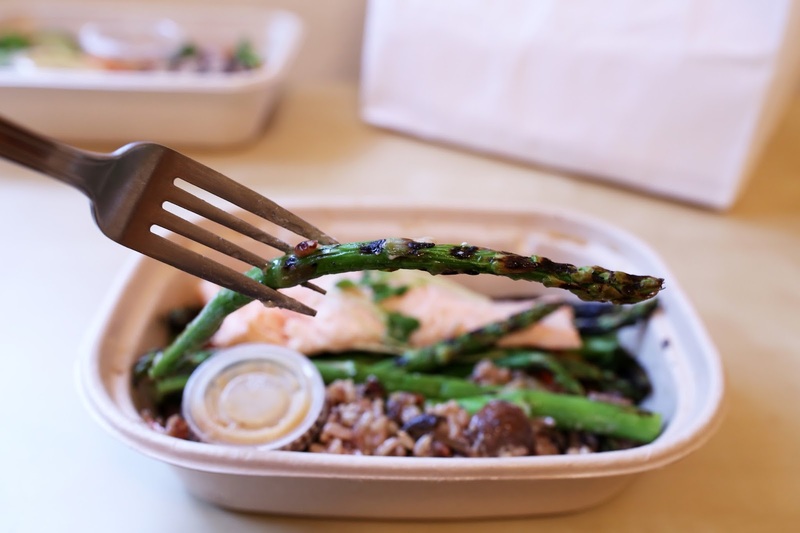 I hope you will enjoy your first Munchery delivered meal! **Please write down your free 30-day trial ending date on your calendar or something. This is to avoid unnecessary charge on your card in case you don't remember. ^_^" (I have bad memories too...) Make sure to unsubscribe the membership before trial ends! Or if you don't feel like you will use Munchery after your free meal, just feel free to unsubscribe the membership right away! Are you sure the $20 credit applies to the delivery fee? I think the fee (which shows up as $3.95 for me) is not covered even if your food order is, for example, $16. @Christine, YOU ARE RIGHT!! Thanks for telling me! I just updated this post so people will know there will still be a delivery fee even though $20 credit is not used up. ^^"
Thanks again and Happy Eating! I will be happy to try this salmon for the first time. This sounds so good ! Good deal for good service.